On paper, the 32PF7521D should make a decent impression. As well as a digital tuner and HD Ready status, it carries Philips' long-acclaimed Pixel Plus picture processing. You'd be forgiven for thinking that this LCD TV would get an automatic green light. Straight away, we feel that the fascia looks a little bland for £1,200 standards. But aesthetic complaints are glossed over by the twin HDMI sockets that proudly adorn its rear. 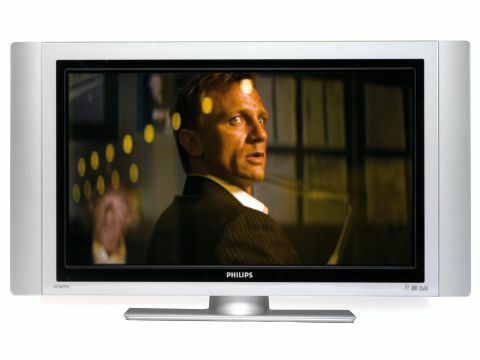 These are joined by dedicated component video and PC jacks too: Philips has clearly learned from its previous LCD TV HD-connectivity shortcomings. The digital tuner also gives rise to two other key connections: a digital audio output for possible Freeview Dolby Digital 5.1 audio broadcasts, and a CAM slot for adding subscription digital services to your channel package. Moving on to the Pixel Plus processing, closer investigation reveals that all is not quite as it first appears. The thing is, while Philips' new high-end LCDs are now up to Pixel Plus 3 HD, the Pixel Plus version on the 32PF7521D is much older. As such, it lacks a number of the sophisticated advances made for later generations of the system - including the ability to process HD material without first having to downconvert it to standard definition. Other features of note include seven-day EPG support for the digital tuner, picture-in-picture facilities, and a contrast expander. The 32PF7521D puts in a slightly disappointing performance with our Layer Cake test DVD and Sky HD broadcast. Immediately apparent, especially with standard definition, is some off-key colour toning that leaves the actors looking strangely orange. Black levels are uninspiring too, meaning some of the darkest shots can look really murky. Although a touch grainy, pictures also generally look pretty sharp. Also, there colour tone problems during our HD Layer Cake session than they are with the DVD - fast moving scenes are plagued with likeably little LCD motion noise. When these strengths happen to coincide, the resulting picture can actually look very nice. Pity, then, that these moments of glory are fairly few and far between. Sonically the 32PF7521D is more consistent, delivering good levels of clarity and volume across a wide area. Bass is in short supply, but then this isn't rare in the LCD world. All in all, the 32PF7521D would make a pretty respectable budget 32-inch LCD TV, and this TV's price is anything but budget. And, at £1,200, it's up against the latest LCD TVs from the likes of Toshiba, Panasonic and Sony - and against that sort of competition, it doesn't really measure up.